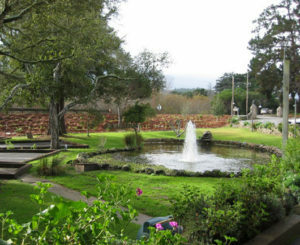 Tucked away amidst an oasis of majestic redwood trees, lush gardens, a tranquil pond with turtles, and unique wishing well, The Monterey Stone Marriage Chapel offers an enchanting wedding venue in beautiful Monterey, complete with numerous wedding photo opportunities. The chapel boasts elegance with its unique wooden arched doorways and timeless stone fireplace. Gentle hues of cream, gold, and white mingle with soft lighting and candlelight adding to its intimate charm. Picture windows overlook and frame the beautiful Redwood Trees and gazebo garden area. Fully decorated, The Monterey Stone Chapel is equipped with a sound system for ceremony music and a private changing room. Reverend Patt O’Brien or Reverend Sherilyn Russo will help you through the process of booking the chapel, officiating your ceremony, issuing your marriage license, and booking a photographer or videographer if needed. Outside marriage officiants are always welcome. Experience stress free, affordable wedding ceremonies in the classical elegance and charm of The Monterey Stone Marriage Chapel. Ask us about our romantic, candle light evening ceremonies! Enjoy the ambiance of an outdoor garden ceremony at our romantic gazebo. Breathe in the aromas of nature as you exchange your wedding vows nestled among the trees and colorful gardens. Chairs may be set up for an additional fee. This enchanting venue can accommodate 50 seated or 100 standing. The grounds are shared with Tarpy’s Restaurant, our on-site neighbors, who feature a five star menu and award winning wine list. 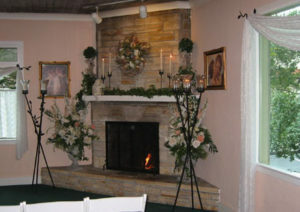 Tarpy’s offers private and semiprivate rooms to accommodate wedding parties of all sizes. A By-the-Sea Wedding is authorized by the County of Monterey to issue the California Confidential Marriage License. Imagine standing 50 feet above the rugged Monterey coastline with crashing waves below as you exchange marriage vows. A By the Sea Wedding in association with The Monterey Stone Marriage Chapel can make your dreams come true. We offer ministers and officiants who will offer sensitive care in handling your wedding needs. 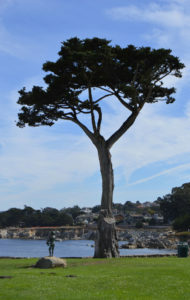 There are numerous grassy park areas in Pacific Grove along the water with Cypress Trees framing the breathtaking Monterey Bay. Sea otters and other marine life can often by witnessed creating a memorable wedding experience. In addition to oceanside wedding settings, we can recommend other locations in the Monterey, Carmel, Pebble Beach and Pacific Grove area, such as quaint bed & breakfast Inns, five star resorts, and historical courtyard gardens. We are flexible with dates, times, and locations within the Monterey area. We cater to couples of all cultures, beliefs, and preferences. If you have any suggestions for personalizing your ceremony, just let us know. On site Receptions are available at Tarpy’s Restaurant, located on the premises. Tarpy’s features Five Star Californian-American Country Cuisine using only the freshest ingredients. With a full bar and an award winning wine list your reception or rehearsal dinner is sure to be a unique and memorable experience. Private rooms, banquet facilities, and catering available. Please call a Banquet Specialist at 831-655-2999 for wedding reception assistance or 831-647-1444 for restaurant reservations. Please feel free to contact us if you have any questions or would like to reserve a time for your wedding. It is best to call us directly as we check e-mail sporadically.